We had a family adventure last week. My husband had been looking forward to it ever since he learned that NASA planned to launch a rocket on his birthday. One of the things my husband and I have in common is that we’ve been fans of the space program since we were children. We didn’t know each other then, but we both watched the Mercury missions on television as children and we both went to Titusville to witness Saturn V launches as teenagers. After we got married and had children together, we took them down there to see Shuttle launches. We both have T-shirts that say, “First Flight, Columbia. I Was There.” We bought them the day the rocket didn’t go up, but they still count because we drove back down to Titusville the next day, when it did. We were definitely there. Last week, we drove to Titusville on my husband’s birthday to see the launch of the new rocket which will eventually take people to Mars. This was just a four-hour test flight, but it was a good-sized rocket and it had been years since we’d seen a launch, so we were excited about the trip. We took our son, our older daughter and two of our grandsons. They spent Wednesday night at our house so we could all get up at 3:15 Thursday morning. The launch window opened at 7:05 and we had a 135-mile road trip ahead of us. We managed to get everyone up, dressed and out the door by 4:15. My husband had done a little research and discovered that Titusville offered more than one place from which to watch a rocket launch. In our teenage years, we just parked by the side of the road, but this time we went to Space View Park. We still parked by the side of the road, because all of the official parking spaces for the park were taken, but then we walked across the road and enjoyed a lovely green space with a beautiful view of the launch site across the river. There were trees, benches, monuments to the space program and actual public restrooms. I remember standing in long lines at gas stations when I was a teenager. When I walked into that park last week, all my memories came flooding back and brought tears to my eyes. My first trip to watch a Saturn V go up was the biggest adventure of my young life. Two of my brothers made a plan to drive down there in the older brother’s purple GMC van. Yes, it was a hippie van. The amazing thing was that I convinced them to let me go along. The even more amazing thing was that I convinced my parents to let me go with them. I was only fifteen at the time and I had never been on a road trip without my parents before. My brothers were older and my parents decided to trust us all to go to Titusville and back in that old purple van. As I remember it, my brothers let me go along because I had a little of my allowance left and they were so broke, we took snacks and a big cooler jug of Kool-Aid just to get us through the trip. It was a good thing we did, because the van overheated in the middle of nowhere and we had to put the Kool-Aid in the radiator just to get it to a gas station, where we then flushed and refilled the radiator. Ah, memories! There’s a monument to the original Mercury astronauts in Space View Park. 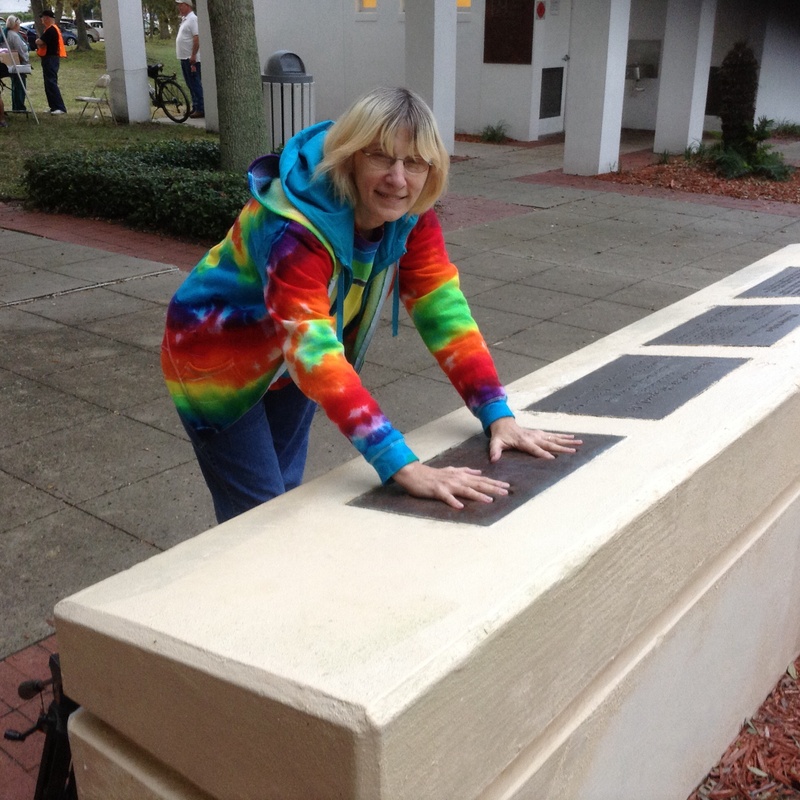 I got to put my hands into the hand prints of my favorite astronaut, Alan Shepard. He was the first American in space, the only Mercury Seven astronaut to walk on the moon and the first person to hit a golf ball on the moon. Seriously, “cool” doesn’t begin to cover it. Last week’s rocket did not go up on my husband’s birthday. Fortunately, he had taken the next day off, too. We drove back to Jacksonville on Thursday and everyone slept at my house again so we could get up at 3:15 Friday morning and drive back to Titusville. That day, the launch went off at 7:05 without a hitch. It was not as spectacular as a Saturn V, but it was still an amazing sight. I hope my grandsons remember it as long as I have remembered my first rocket launch. This entry was posted in Uncategorized and tagged Alan Shepard, family adventure, NASA, rocket launch, Saturn V, Space View Park, Titusville on December 10, 2014 by releaf1954. I do know, if it’s the one for whom you wrote a song. They’re all great, but Alan Shepard has always been my favorite. Sounds like a fun trip–so glad you got to take two of the boys.